Chip Atkin from SEIU local 1021 discusses impacts of the fire on public employees at last week's "Just Recovery" meeting. More than 20 labor, environmental and social- and economic-justice organizations banded together July 19 to endorse the Alliance for a Just Recovery’s 25-point plan to ensure a “just recovery” following last October’s unprecedented wildfires. The self-described grassroots organization called for unity and action from community members and politicians to address problems plaguing Sonoma County, such as lack of affordable housing, good jobs, living wages, environmental sustainability and equality across language divides. Local city councilmembers and representatives of Congressmen Mike Thompson and Jared Huffman joined more than a hundred other attendees in Santa Rosa’s Christ Church United Methodist multipurpose room, where chairs were added to accommodate the crowd. In their mission statement, the Alliance for a Just Recovery (AJR) demanded Santa Rosa take immediate action to address income inequality by adopting rent control and implementing the state-mandated $15 minimum wage three years earlier than required. It also proposed penalizing construction contractors for exploiting immigrant labor and establishing a worker’s rights clinic to protect disenfranchised workers. Marty Bennett, co-chair for North Bay Jobs with Justice and spokesperson for AJR, said the fires, which destroyed 5 percent of Santa Rosa’s housing stock, also caused a 36 percent increase in rents. Sonoma County was already fraught with income inequality and skyrocketing rents when last year’s North Bay wildfires killed 42 and turned the region on its head. The loss of 5,550 homes across the North Bay exacerbated the already unstable housing market, which, according to a report by the Sonoma County League of Women Voters, posted a 1.5 percent vacancy rate pre-fire, a .5 percent vacancy rate post-fire and a lack of affordable housing. According to the AJR, median-income families cannot afford to purchase median-priced homes; 44 percent of Sonoma County’s Latino families and 35 percent of total families are “working poor,” making less than $50,000 each year. “We can start here in Santa Rosa to build a movement for a just recovery during the 2018 election cycle,” Bennett said. Fire victims gave testimonials of their plight, some accompanied by translators; Spanish-speaking attendees received translations of English speakers through portable headsets. Ofelia Alcala, housekeeper of 28 years at the Hyatt Regency Hotel in Santa Rosa, spoke through a translator about the plight of Spanish-speaking workers in the hospitality industry. She said she recently attempted to unionize Hyatt employees, but the company refused to negotiate. 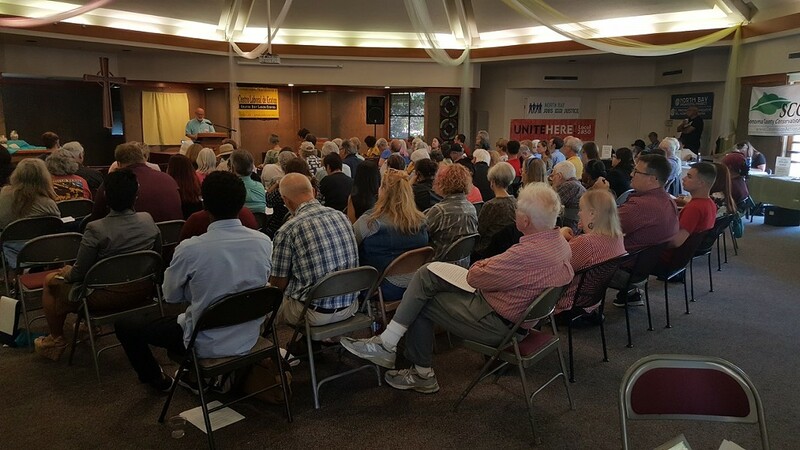 A representative from the Graton Day Labor Center, which created the donation-based UndocuFund last fall to provide financial relief for undocumented residents not entitled to public assistance, said the undocumented still fall prey to wage theft and exploitative, illegal housing arrangements. Laura Neish, executive director of the environmental advocacy group 350 Bay Area, said the wildfires were caused by climate change and underscored the need for sustainable policies in the recovery. Other speakers decried the insufficient insurance payouts for low- to moderate-income homeowners trying to rebuild and the increasing rents driving many Sonoma County citizens, including retired seniors, out of the region.